Wanted to get out a year end thank you and holiday best wishes to all the customers who helped me have a great season on the water this year. From opening day until the last day, this season Nov. 2nd it was a pleasure to spend a day in the boat with all of you. I feel very fortunate to live 10 minutes from the Turtle Flambeau Flowage , it has always been my favorite place to fish, it is a privilege to share it's beauty with the people who choose my guide service. In general it was a good season as far as the fishing went, the walleye fishing did get slow late July until the fall bite in September. There was a very successful walleye spawn this spring along with a good hatch of yellow perch, trout-perch and from walleyes I looked at pan fish such as bluegills and crappies. Lowering a jig into this rich forage base made for more challenging fishing late summer when it was all in full bloom. Despite this we always ate good on all of our shore lunches, the flowage with its rich diverse fishery provides other species of fish to catch when one gets slow. Hope all the fellow hunters had an enjoyable season, youngest son Tom and I went west to Idaho the week of Thanksgiving. We camped and hunted in the mountains something we had never done before. The country was beautiful and challenging we were both fortunate to get a buck, Tom's considerably bigger than mine he was pretty happy with that. Looking forward to the ice fishing season which is awful slow in coming this year with the warm weather, hoping to be fishing soon after Christmas providing the ice is safe. 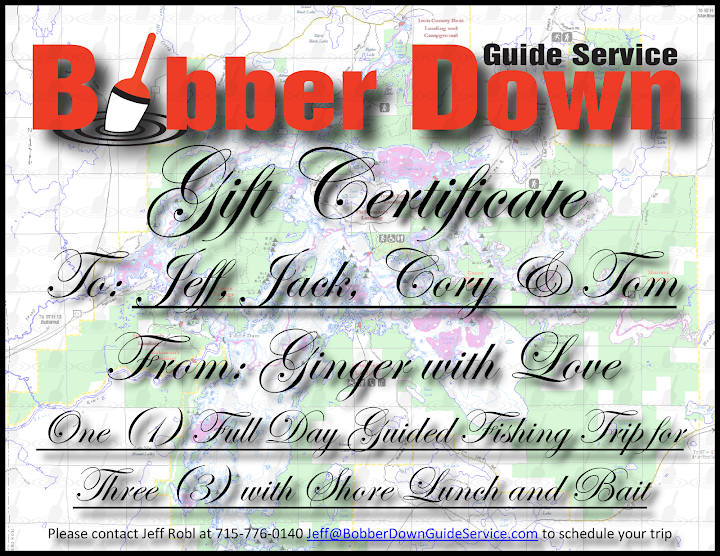 If anyone is interested in a last minute gift, I do have nice gift certificates that could be mailed out asap.